The KC-130J multi-role tanker achieved initial operational capability in February 2005. Photo by Michael R. Holzworth, TSgt, USAF. The KC-130J carries 92 ground troops or 64 paratroopers and equipment while conducting tactical transport duties. Photo by Capt. Joshua Diddams. The KC-130J can carry a maximum fuel of 61,364lb. Photo by Sgt. John Jackson. The aircraft is powered by four Rolls Royce AE 2100D3 turboprop engines. Photo by Lance Cpl. Corey A. Blodgett. The KC-130J aircraft conducted first combat aerial delivery in Iraq in April 2005. Photo by Cpl. Joel A. Chaverri. The KC-130J is a multi-role tanker aircraft designed and developed by Lockheed Martin to replace the KC-130F/R/T aircraft. The KC-130J is in operation with the US Navy, the US Marine Corps (USMC), the Italian Air Force, the Kuwait Air Force and the Royal Saudi Air Force. Primary missions of the KC-130J tactical aircraft include air-to-air refuelling, tactical transportation of passengers and cargo, aerial delivery, ground refuelling and emergency re-supply. The first KC-130J completed its maiden flight in June 2000 and achieved initial operational capability in February 2005. A fleet of 47 KC-130J Hercules aircraft are being operated by the US Navy and the USMC. The total requirement of these two operators is 104 aircraft. The KC-130J features modern aerial refuelling capabilities and is designed based on the C-130 Hercules tanker technology. It can be integrated with modular systems for providing close air support to troops and conducting multi-sensor image reconnaissance. The aircraft can also be deployed in logistic support and medical evacuation missions from ungraded landing zones. The crew of the KC-130J consists of two pilots, two loadmasters and one Advanced Crew Stations (ACS) operator. KC-130J can accommodate 92 ground troops or 64 paratroopers and equipment while conducting tactical transport duties. It can carry 74 patients on stretchers and their accompaniments in medical evacuation role. The aircraft measures 29.3m in length and 11.4m in height, and has a wing-span of 39.7m. It has a maximum gross take-off weight of 79,380kg. The cargo volume of the aircraft is 4,551ft3. It can carry a maximum fuel load of 61,364lb when fitted with external tanks. The optionally fitted fuselage tank stores 24,392lb of fuel. The fuel unloading capacity of the aircraft is up to 600gal a minute. The KC-10 Extender is an air-to-air refuelling tanker aircraft. The glass cockpit of the KC-130J incorporates head-up displays, multi-function displays, dual inertial navigation systems, traffic alerting and collision avoidance system, ground collision avoidance system, global positioning system, automatic direction finder and radio communications systems. The KC-130J aircraft is armed with Harvest Hawk (Hercules Airborne Weapons Kit) modular roll-on, roll-off weapons system. A fire control console is placed on a standard pallet in the cargo compartment. The weapon system employs four Hellfire air-to-surface missiles fitted in place of the left-hand aerial refuelling pylon. It can also fire standoff precision-guided munitions, including the Raytheon AGM-176 Griffin and the MBDA GBU-44/B Viper Strike missiles from the cargo compartment. The AN/AAQ-30 target sight system aboard the aircraft provides the capability to detect the targets at long ranges. It is mounted on the under wing fuel tank in the left and consists of infrared and electro-optic sensors. The KC-130J aircraft is fitted with four Rolls-Royce AE 2100D3 turboprop engines, which develop a power of 3,425kW each. Each engine drives an all-composite six-blade R391 propeller. "The aircraft has the capacity to carry a maximum payload of 47,903lb with maximum wing relieving fuel." The aircraft has the capacity to carry a maximum payload of 47,903lb with maximum wing relieving fuel. It can achieve a maximum range of 4,275nm with external tanks. The US Department of Defence awarded a $4.3bn contract to Lockheed Martin in 2002 to deliver 40 C-130J aircraft for the US Air Force and 20 KC-130J tankers for the USMC. The first KC-130J tanker was accepted by the USMC in April 2004. The aircraft conducted first combat aerial delivery in Iraq in April 2005. 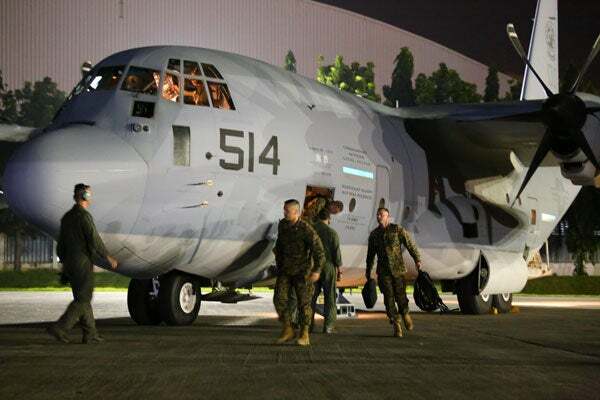 The USMC received the first KC-130J Super Hercules aircraft in March 2014. Lockheed Martin delivered six KC-130J tankers to the Italian Air Force (Aeronautica Militare Italiana) in 2005, concluding a 22-aircraft programme. Lockheed Martin secured a $18.4m contract from the US Naval Air Systems Command (NAVAIR) in May 2012 to manufacture and test three Harvest HAWK systems for KC-130J fleet. Lockheed Martin is also responsible for upgrading seven KC-130J aircraft for the integration of the Harvest HAWK systems. The work is scheduled for completion in June 2014. The US Government awarded a $245m foreign military sales contract to Lockheed Martin in May 2010 to deliver three KC-130J tanker aircraft for Kuwait Air Force. The first aircraft was delivered to the Kuwait Air Force in August 2014. Lockheed Martin signed an Undefinitised Contract Action (UCA) agreement with the US Government in October 2013 to supply 25 potential C-130J Super Hercules airlifters for the Kingdom of Saudi Arabia, under a foreign military sale programme. In March 2016, Lockheed Martin delivered two KC-130J Super Hercules aerial refuelling aircraft to the Kingdom of Saudi Arabia. We build high-tech special ops video equipment for aircraft, such as: LCD monitors, aircraft computers, and high-definition video splitters and amplifiers.